Porsche have just released sales and financial figures for the first quarter of 2013, and it's pretty much good news across the board. Sales of every model are up on the same quarter in 2012, with the exception of the Panamera which has dropped from 7,524 sales in Jan-Mar 2012 to 5,669 in the same period this year. This could be explained by the arrival of an updated model, or because Porsche teased us with the Sports Touring concept which is a beauty to the standard Panamera's beast. Elsewhere the 911 saw a 19% rise in sales from 6,095 to 7,230, the Boxster/Cayman saw a 157% rise from 1,732 to 4,452 and the Cayenne saw a 29% increase from 15,502 to 19,658. Combined sales of the 911, Boxster, Cayman and Panamera are 17,351 - compared to the Cayenne's 19,658. The Cayenne isn't even built at Stuttgart, instead it's made on the same production line as the Audi Q7 and Volkswagen Touareg in Slovakia. Now you can see why Bentley and Maserati are thinking about building an SUV. 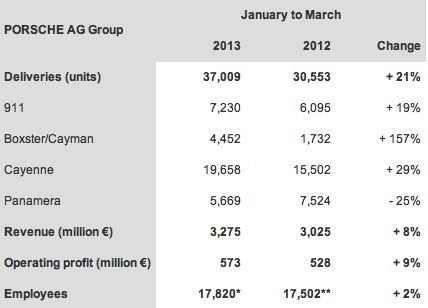 In the January to March period Porsche's revenue was €3,275 million whilst operating profit was €573 million. Divide operating profit by the sales of 37,009 to work out that Porsche makes a staggering €15,482.72 profit on each vehicle. Divide turnover by 37,009 sales to work out each car sold for an average €88,491. In comparison VW Group make an average profit on each car of €987, with an average sale price of €19,606. Porsche AG might be a relative minnow in the vast VW Group but they punch above their weight when contributing to the company coffers. And things are only going to improve for Porsche with the introduction of the Macan SUV, 918 Spider supercar and revised Panamera. We just hope the baby Boxster and Panamera Sports Touring aren't too far away. The figures are shown in full below. 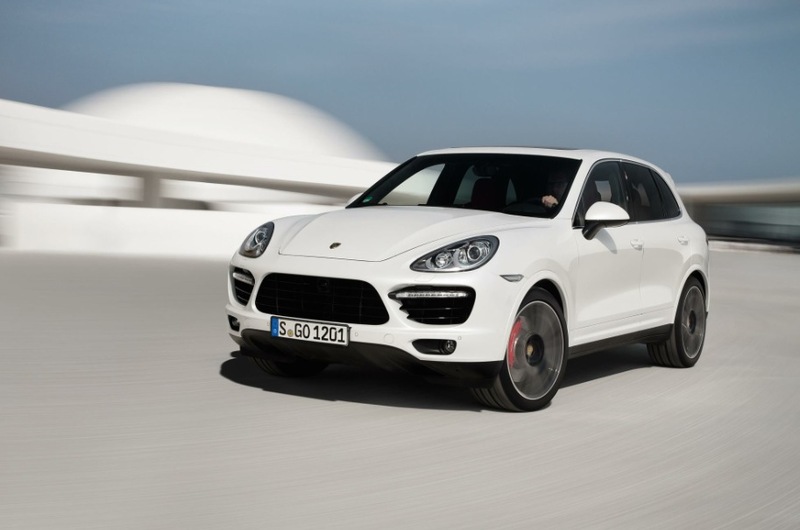 Update: Several people have stated the Cayenne is built in Leipzig, Germany. It's actually constructed in Bratislava, Slovakia and assembled in Leipzig. Further update: New 911 Turbo revealed.